Prediction: Mayor Camardelle and Chief Dubois will be roasted to a crispy brown…..
Paul Purpura has a must read for those that want to catch up. Other vital background can be found here. The mayor and the mother then were allowed to be in the room when Dubois questioned Dantin. 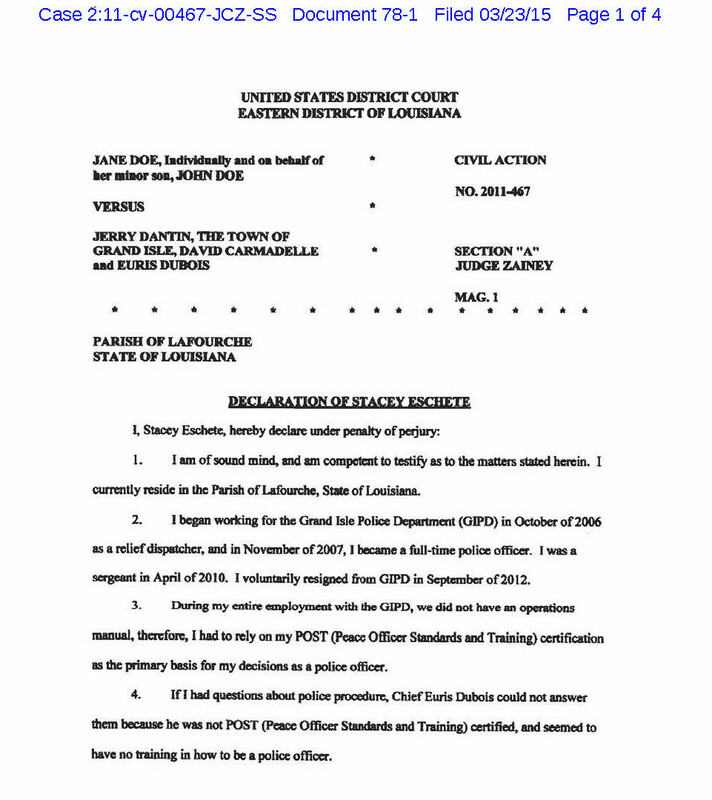 When Dantin began to confess, Dubois was unable to find an operable voice recorder, and his assistant was unable to take notes, according to the lawsuit. Camardelle, meanwhile, “was crying hysterically and uncontrollably, at times lying on the floor,” according to the lawsuit. Camardelle at one point thought he was having a heart attack. He was not. The mother’s lawyers accuse Camardelle of intentionally disrupting the confession. Dantin was arrested. But the mother, questioning the slow pace of the investigation, said prosecutors repeatedly asked for the investigative reports from Grand Isle police, to no avail. Author Douglas HandshoePosted on May 18, 2014 May 18, 2014 Categories SopTags Child Molestation, Deprivation of civil rights under the color of law, Doe v Dantin Grand Isle Carmadelle Dubois, Grand Isle Mayor David Carmadelle, Grand Isle Police Chief Euris Dubois, Jerry "Captain Jay" DantinLeave a comment on Prediction: Mayor Camardelle and Chief Dubois will be roasted to a crispy brown….. Please pardon this late reply to your faxed letter of June 4, 2013 as I have been out of my office on business. I have appointments scheduled both June 10 and June 11, 2013 and will not be available for any telephonic hearings on those dates. 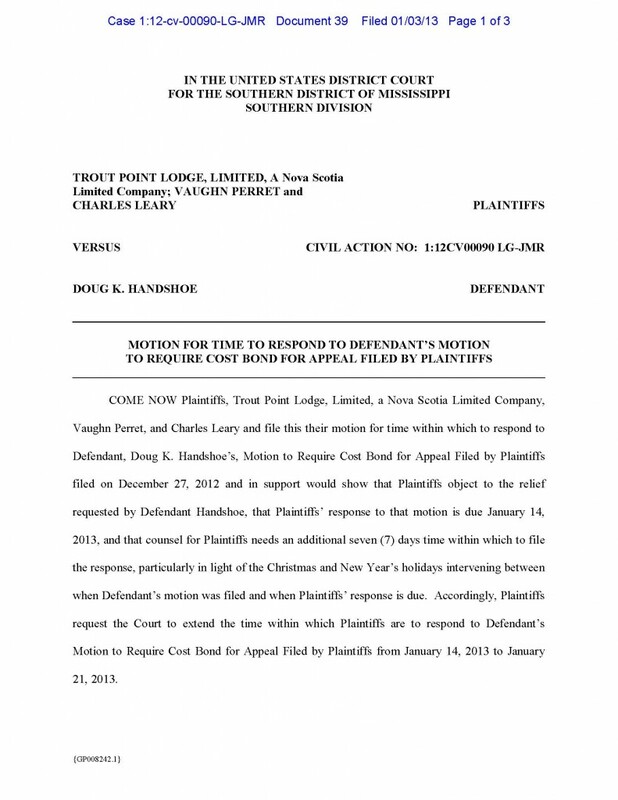 If you conduct an ex parte hearing in my absence please note it is without my consent. 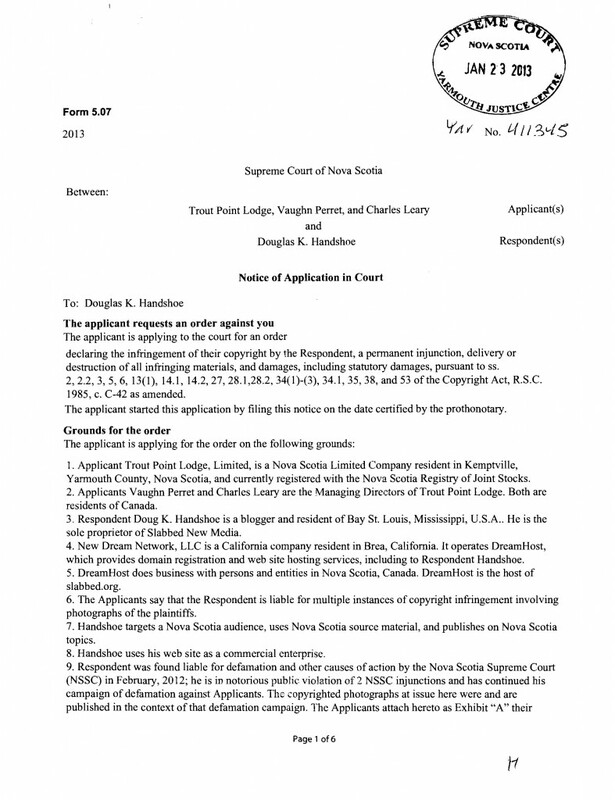 That said I have noted Leary and Perret’s continued efforts to deprive me of my civil rights to respond to their dubious allegations levied under the US law known as the DMCA in Canada. I also note your court was once used by Leary and Perret before to deprive myself and at least 4 other US Citizens of their civil rights in the Louisiana Media case and I have doubts you were unaware of their specious use of your courtroom for that purpose. 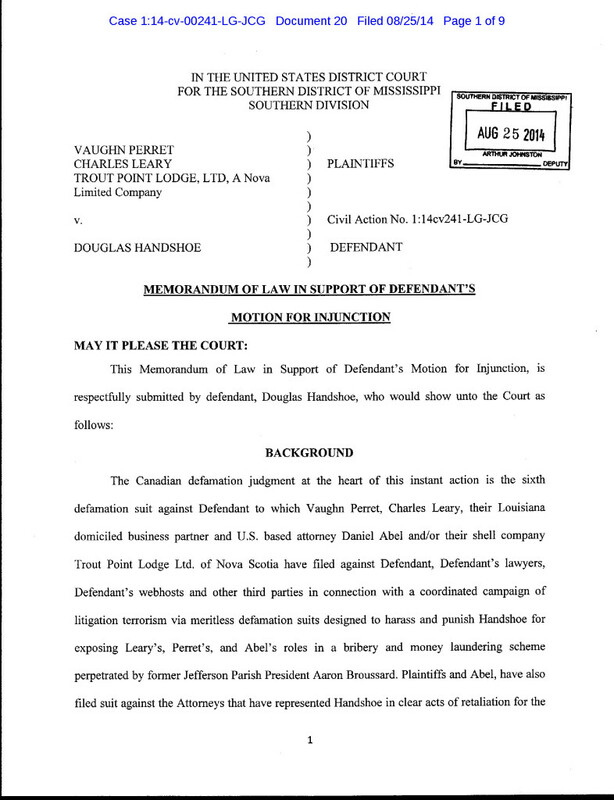 I did not respond to Leary and Perret earlier letters to you trying to exclude my court filings though I will note they will be used in the civil suit I filed against them in Mississippi related to the abuse of processes that occurred in your courtroom in the Louisiana Media case. I have included a copy of this suit for your reference. Since the freaks in the Goatherder Nation hang on every word I say….. Author Douglas HandshoePosted on February 6, 2013 March 14, 2014 Categories SopTags Aaron Broussard, Bribery, Charles Leary, Copyright Trolls, Daniel "Danny" Abel, Deprivation of civil rights under the color of law, Digital Millennium Copyright Act, Goatherders, Libel terrrorism, Some idiots will never learn, USA v Broussard, Vaughn Perret4 Comments on Since the freaks in the Goatherder Nation hang on every word I say….. The question is no longer who has been hacked. It’s who hasn’t? The Washington Post can be added to the growing list of American news organizations whose computers have been penetrated by Chinese hackers. After The New York Times reported on Wednesday that its computers as well as those of Bloomberg News had been attacked by Chinese hackers, The Wall Street Journal said on Thursday that it too had been a victim of Chinese cyberattacks. The above illustrates the vulnerability of sophisticated corporate networks to hacking but we also learned that from News Corp in the UK in 2012. I mention this because last month the Times Picayune’s Gordon Russell wrote a story on Fred Heebe’s witch hunt for a private citizen that used the guest computer at the International House Hotel to comment on NOLA.com about the scandal in Jefferson Parish, specifically Dutchie Connick’s role in the alleged conspiracy between the River Birch Landfill and the Broussard Administration to put in the fix in favor of River Birch and close the Parish’s own landfill. 1. The IP information of this commenter was obtained from a second party marketer or vendor?……..
4. Heebe’s team somehow knew that the commenter was using the hotel’s computer already and they put a keystroke recorder on it in order to track down the exact time and date the commenter was using it……….